Does that ever really happen? Do you ever truly outgrow the teenage version of yourself? I think yes and no. Yes, you learn and you grow and you develop thoughts and opinions and everything. However, no, you still hold on to some pieces of childish innocence and fun in your life, if you're lucky. Take, for example, me. My enjoyment of the teenage literature and movie culture craze - the Twilight phenomenon. I'm one of those for sure...however, I'm not the extreme, but I haven't ignored it either. Last fall, I went to the midnight showing of New Moon. It was quite the experience. And I'm not embarrassed to admit that I was there...I found it hysterical that my fellow movie goers were women both teenage and middle-aged and a smattering of young men too. The crowd definitely hooted and squealed when certain male cast members graced the stage. The teenage me had a great time and you know what, the adult me had fun too...it helped that I didn't have to be at work the next day. Devil's food cake (ironic) topped with deliciously light buttercream frosting coated in vanilla jimmies on the outside to give it the right crunch. 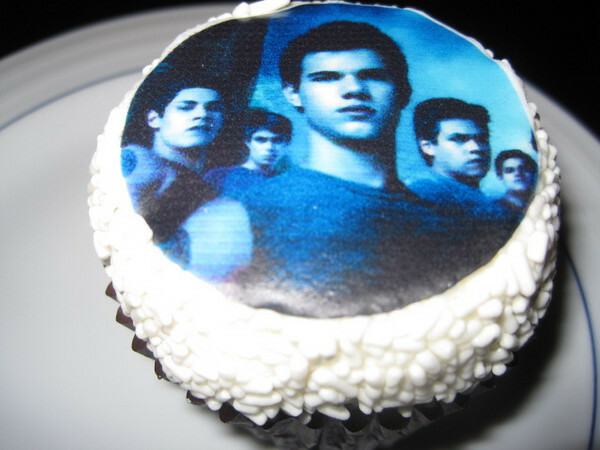 And the edible image of the wolf pack on top. Hooray! Now the teenage self knows that eating this will be yummy and a good reward for a hard workout. The adult self doesn't feel much different but knows exactly the points value and how long that workout will have to be. But it was worth it. Actually - this was almost as yummy as our wedding cake. And trust me, our wedding cake was irreplaceable! The morale of this "saga" (ha, ha - fellow Twi-hards will understand) is that new bakeries are always great to try and you never know what you'll find. And never let go of the teenage you...I'm certain that without her, I'd miss out on great books, movies and definitely good times over popcorn with friends and silly movies or late night talks with my sister and of course that crushy feeling about the love of your life. I'm just lucky to still have all these pieces in my world. Go teenage me! Summer storms are one of my favorite things. I love the lightning and the thunder...when I'm safe and sound inside. Unfortunately, you never know when something is going to happen, so you can't plan to be safe and sound ahead of time. Take for example last Wednesday. The crazy weather (that resulted in a tornado in neighboring towns) resulted in the trains being stopped during the storm. And let me tell you, seeing the streets covered in water and the rain coming down so hard you can't see out the other side of the train is enough to freak out even the calmest person. Some of my fabulous fellow train passengers were great fodder for people watching as well as a study in people. The individual that asked the conductor about 100 times when the train would start moving and if we were going soon. So frustrating, because you know that the conductor is choosing to hold the train of course. It's part of his evil plan to hold us all hostage on an elevated train stop in the middle of armageddon. The young businessman that has to be somewhere immediately. This individual is willing to take the conductor's offer to get off the train in the middle of the monsoon and walk to the nearby El train line. Because where they have to go is important and not worth staying indoors for. The helpful person...the one that is willing to console the panicked child or the uncertain father of the panicked child or the young adults unsure of what to do next. All these pieces made up the puzzle of the train I rode. Craziness...so many down trees, so many damaged houses, fortunately, I don't believe anyone was hurt in the process. The best part of the storm...it's result. This beautiful double rainbow. However, it was there for only a minute or two...but then it was gone. More clouds rolled in and it wasn't there anymore. So I'm so glad that I was able to see it. 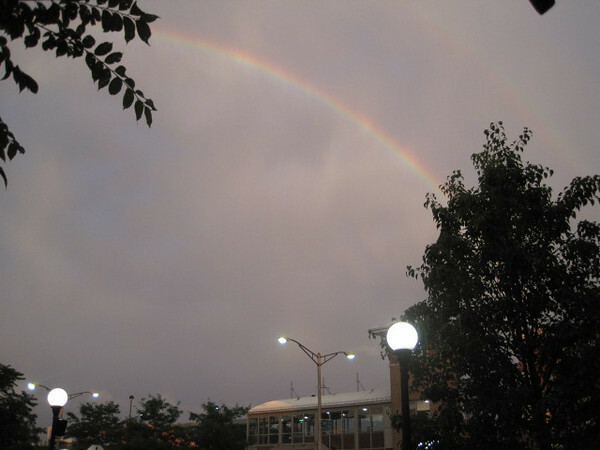 So even though the night was full of raindrops, thunder and lots of lightning, it ended well. With rainbows in the sky and a great time with my family. Thanks to Mom & sister for picking me up from the town I was stuck in.